– If the goal of training is race simulation, then the hardest intervals must be accompanied by a dire need to piss. Just because you know how doesn’t mean circumstances will permit it. – Alongside artisan and robust, we hereby ban the word ‘epic’ since its overuse is rife and the bar for what constitutes epic-ness has fallen so low. It’s so neatly summarized here. 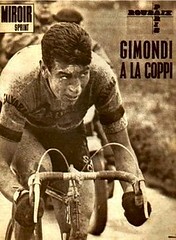 – The best part of the 60’s is the wristwatches Gimondi & co. raced in. From a style standpoint it’s the single thing of the era that we as bike-worshipping men should aspire to emulate. IWC is aesthetically correct, but so forbiddingly expensive. Nixon is epic-proof wicked tough but maybe a smidge too youthful. I’m a bit lost for direction so I’ve been exploring and admittedly I’ve done so under the influence of a half-bottle of wine, 2 margaritas, then the second-half of that bottle which is my only excuse for ending up on this dodgy site with counterfeits so good that (blame it on the boozy-boozy) they tempted. It was only in a fleeting way and I promise I bought nothing, but I felt it and the morning after I couldn’t help but think of that scary black hole at Interbike called ‘The Taiwan Pavilion’ where Intellectual Property goes to die. When will the knock offs in the bike biz evolve from bottle cages and wheels to ProTour framesets? I’m not talking structural replicas branded with awkward 8th grade would-be English names but ones that are perfect replicas all the way down to the decals, the details, and the ‘Made in Italy’ sticker. – SIBE #3: Ludo Dierckxsens’ banned-in-America Rudy Project Stratosphere helmet. Preferably in Lampre purple. – A visually-clotted but nonetheless interesting site: Climb by bike. Not my best terrain, but an esteemable project for sure. – Terrain closer to my heart? 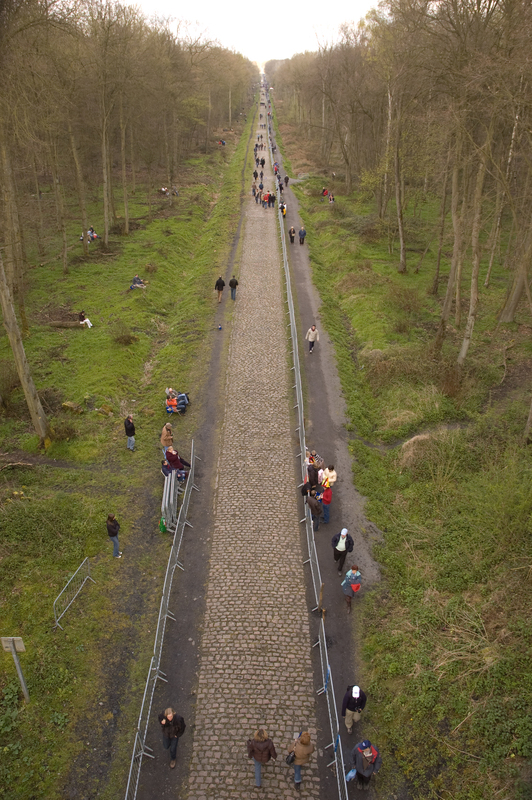 The pavé. Dig this fantastic photo. It’s huge resolution so give it a few seconds to load and use your mouse to zoom on it. The texture & all-in-all epicness massiveness of the Forest of Arenberg comes through here like almost no other photo I’ve ever seen. – After 39 years of searching for my life’s purpose, I’ve finally found it: Unpacking the awesome meaning of the 2003 Paris-Roubaix. The more I watch the video (twice today) the more I see that must be discussed and I hereby devote the rest of my life to teasing out the meaning of the day. Next week I think I’ll do a sonnet or an interpretive dance. For now, though, I’ll limit myself to trivia by mentioning that unlike the cheapo tape jobs most-often seen by PRO teams to hold in their radio earpieces, the almighty Belgian supergroup Quick Step got armed with $160/set Bang & Olufsen Earphones that in their stainless, multi-adjustable glory neatly curved above the ears of Museeuw, Boonen, Knaven, VDB, et al. For the cleverness of that alone, I hereby file my dissent in any talk about race radio bans. – From the Dept. of RTFM, a quick mention of the Campagnolo Ultra-Torque bottom bracket is in order. Don’t let the word ‘torque’ fool you because the instructions make it clear that a torque wrench is not the first choice for an installation tool. Rather the preferred method is for you to slowly hand-tighten your cups and, while doing so, coat the threads with Loctite 222. This is no ordinary Loctite. First off it costs $30/oz. Secondly, it’s anaerobic so it only activates once you’ve fully hand-tightened the cups and thereby removed them from the presence of oxygen. Once you’ve done the hand-tightening (‘do not overtighten!’), you proceed with the installation of the BB clip and then install the cranks. I mention this apropos of nothing. It’s interesting, perhaps, because we’ve rightly become a torque-conscious industry and the sight of a torque wrench on your mechanic’s bench is a sign of professionalism. Hand-tightening something flies in the face of all that. That being said, Campagnolo acknowledges in their manual that not everyone will follow the Loctite 222 route. In this case, attach the UT-BB130 bottom bracket tool to your torque wrench and cinch down the cups to 35Nm.